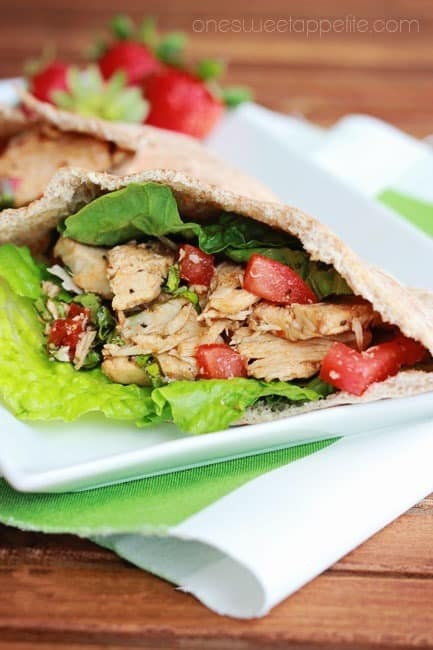 Anyone else loving pita’s right now? 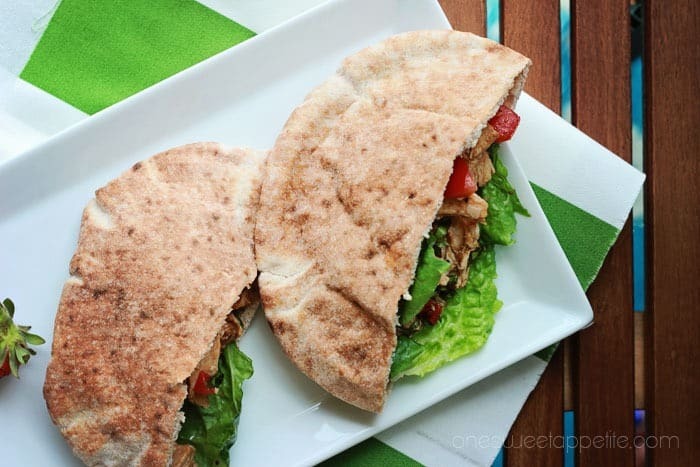 Ever since I made my pita/flatbread I’ve been wanting to create some great picnic foods to go along with them. We eat outside a lot and plain ol’ chicken salad was getting a little boring. 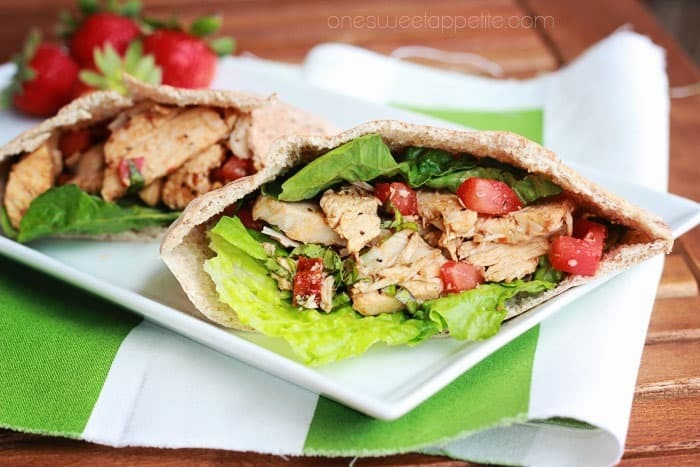 This Italian chicken pita was just what we needed to give us a flavor boost! 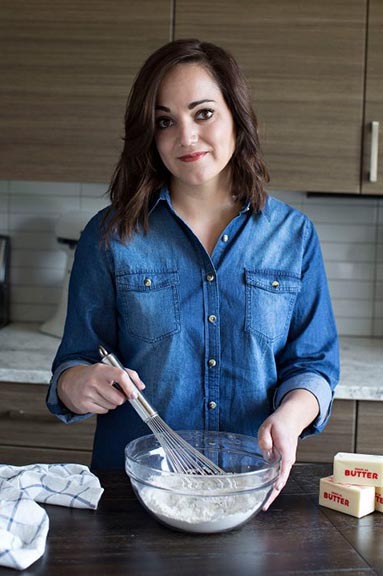 Normally I’ll change up a recipe that I find but this one didn’t really need much changing. The balsamic vinegar really added a punch of flavor, and anything stuffed with tomatoes gets a gold star in my book. My five year old (however) wasn’t so convinced. For his version I left off the lettuce and used spinach in it’s place. I also doubled up on some cheese for the little guy which landed the recipe in his top favorite pool side meals. Just a little tip from one girl to another (or, er… to a guy)… We freeze our leftover grilled chicken. Slice it up and toss it into some freezer friendly bags. Whenever we are ready to eat we just pull them out and heat things up. Makes whipping up lunch a snap! Whisk together the vinegar, sun dried tomatoes, oil, salt, pepper, and garlic. Toss in the chicken, tomato, cheese, and basil. 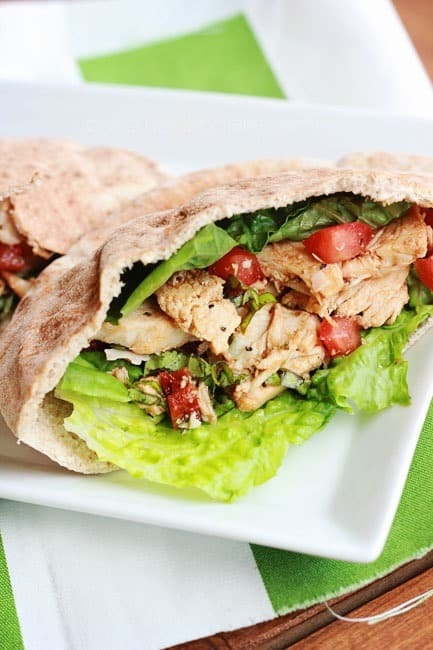 Fill your pita with your greens and chicken mixture and serve. 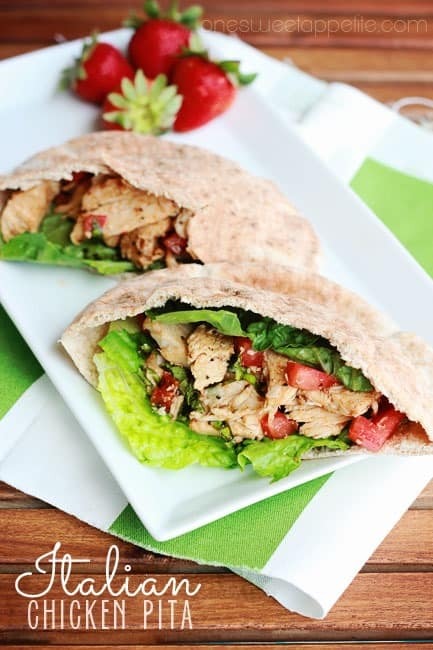 Wrap your pita halves in parchment and you’ve got a ready to go packed lunch that is perfect for the park, pool, beach, or wherever your travels take you. The dressing is actually one of my favorite chicken marinades as well. It has the right kind of summer flavor. Pair this with some mint fruit salad or baked onion rings and you’ve got a light lunch that’s fit for a king. According to the original recipe this is a fairly healthy lunch coming in at a whopping 342 calories for two halves. Personally I could only finish one and didn’t even realize that this was healthy. It’s so filling and tasty that the thought would have never crossed my mind if I hadn’t glanced to the nutrition info on the side!